Emily and I spent a little over a week in Los Angeles, CA, staying mostly with her sister and her sister’s boyfriend. Cory and Thiago were the most gracious hosts and we are so appreciative of them taking a week off to show us around and spend time with us. Our good friends Nick and Natasha flew down from Sacramento to spend the weekend with us, and we got to stay a stone’s throw from the beach at Natasha’s Dad’s house. We had a blast. That’s not to say we didn’t face a little adversity, but LA has been a really great experience. Just as Emily did an overview of our time in Zion, Bryce, and the Grand Canyon, I’ll cover what to do in LA, in two parts. Full disclosure- I love science and science stuff. Naturally, the California Science Center was one of my favorite places we visited. Cory, Thiago, Emily, and I spent almost a full day at the Center. Admission was free, but we did pay a little bit to enjoy some special exhibits. The space shuttle Endeavor is presently housed at the Center and is absolutely worth a visit. Only six shuttles were ever built. 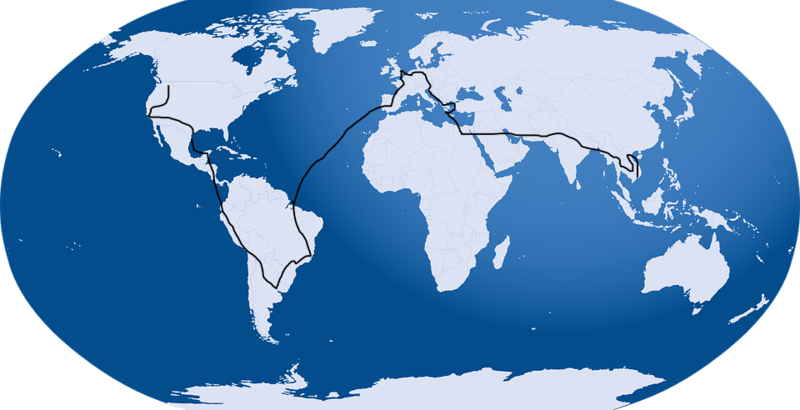 Two were lost during missions, and only four remain. Seeing the Endeavor up close gave me goosebumps. The Center does a great job posting knowledgable guides around the Endeavor that are happy to answer any question you might have about the shuttle, its missions, or the science and history of the shuttle program. Thiago and I spent a solid 15 minutes learning all about the heat tiles on the underside of the shuttle with a mustachioed gentleman who was just as thrilled to talk about the topic, as we were to learn about it. Finally, many of the permanent exhibits at the Center are very hands-on and geared towards kids. I had a great time, but I think Emily was ready to leave long before I was. 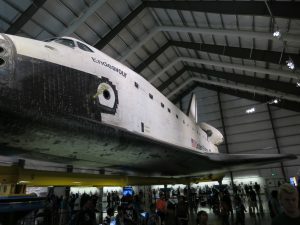 Overall, the California Science Center was a fantastic experience and I would recommend anyone visiting LA to visit, at the very least just to see the Endeavor. Our second night in town, around 12:30AM, Thiago burst into the living room where Emily and I were sleeping and exclaimed “Get up. LAPD has ten cruisers rolling past our apartment and the Search Helicopter is overhead.” Peering out their balcony, there was indeed a convoy of LAPD patrol cars, and a chopper buzzing overhead. I felt like I had four stars in GTA. One patrol car posted up at the top of the block to set up a perimeter and they were close enough I could hear their radios. Apparently, a car with four occupants smacked into an LAPD officer on a motorcycle and all four occupants fled. I did primarily criminal defense work in Montana, and let me tell you, running from the police is always a terrible idea. So, great work guys. While gawking at the officers from our 3rd story balcony, I saw what appeared to be a person hiding in the back of a truck bed. I mentioned this to Cory, Emily and Thiago, and they all excitedly shared that they saw the same thing! While Cory dialed 911 to give them the hot tip, Thiago retrieved his tactical flashlight to shine in the back of the truck. Emily and Cory (and myself) all thought that shining a flashlight at a possible fleeing suspect was not the best idea, but Thiago is his own man and does what he wants. Upon illuminating the truck bed we discovered that despite all four of us independently “seeing” this would-be fugitive, our imaginations got the better of us. Our hit-and-runner was nothing more than an anthropomorphized vacuum cleaner and associated cleaning supplies. I’m not sure who was more disappointed, Cory, or dispatch. We later learned that the officer struck by the vehicle was not seriously injured, and all four suspects were arrested by the next morning. There are two Getty museums in LA. One is a large, traditional museum, and the other is at a smaller location created in the style of an ancient Roman country home. The architecture is designed to make you feel like you’re in ancient Rome while viewing artifacts from the period. The gardens surrounding the villa and views of the ocean were gorgeous. Entry was free, but parking was about $15 per vehicle. 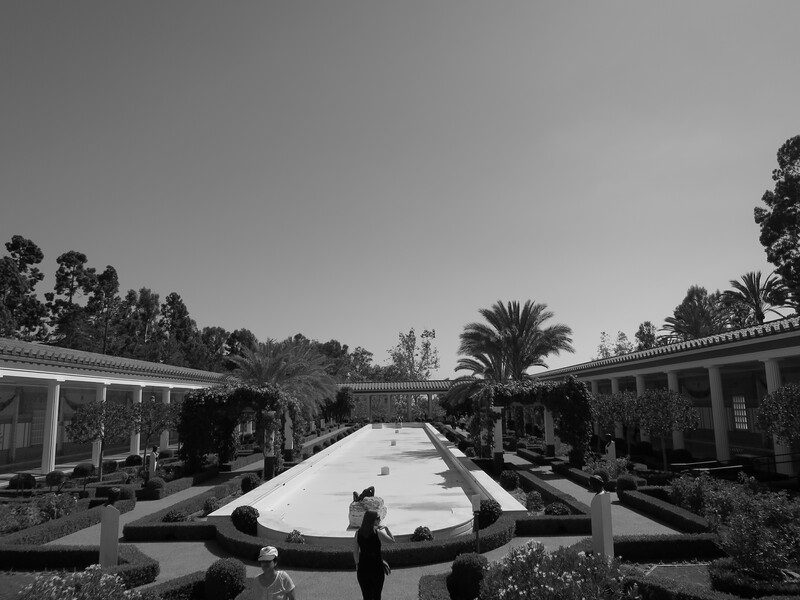 If you like ancient Greek and Roman history, the Getty Villa is a nice way to spend an afternoon. 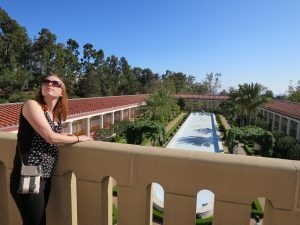 Emily glances at the third floor of the Getty Villa. It’s really, really hard. Thiago, Cory, Emily, and I spent a day at Bruce Beach early on the in the week and Thiago brought along his surfboard. I was an avid snowboarder for a number of years as a teenager and I figured many of the same principles apply. They don’t. At least not for me. I was never able to stand up, but I was able to ride a few waves simply laying down on the board. I was much more adept at body boarding with a short board than I was with an actual surfboard. In Part II, I’ll cover our visit to Riot Games HQ, the Los Angeles County Museum of Art, our favorite places to eat in and around LA, and I’ll tell you all about how our car broke down in Inglewood. Stay tuned!